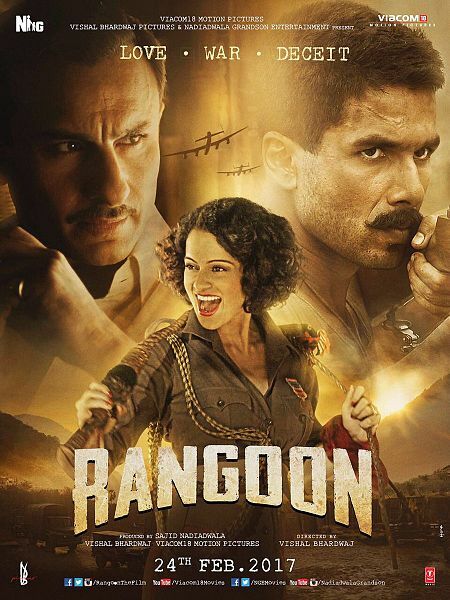 Hello Guys, We sharing some beautiful, romantic and stunning dialogues of Rangoon movie. This is an upcoming drama film which is directed by most successful director Vishal Bhardwaj and produced by Sajid Nadiadwala and Viacom 18 Motion Pictures. This is the period film, the film set has prepared during World War 11. Sahid Kapoor, Saif Ali Khan & Kangana Ranaut are playing main lead role. The trailer of Rangoo film has already released. The trailer is awesome. Trailer shows, a very intense love triangle between Sahid, Saif & Kangana. Kangana playing the role of Julia, a film actress from the 1940s. Sahid Kapoor is playing a good character Nawab Malik on other hand Saif Ali Khan playing the filmmaker. Rangoon movie trailer has also some romantic and stunning dialogues are delivered by Saif, Sahid & Kangana. So Here We have collected all best dialogues of this film. I hope, you will like the dialogues of this film. The film is releasing on 25 January 2017.